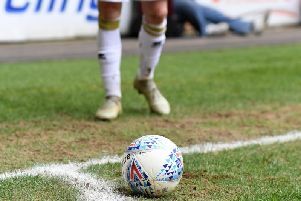 Will Grigg has been nominated for the League 1 Player of the Month award for April, while boss Karl Robinson has also been listed among the candidates for the managers’ award. Grigg hit the back of the net six times in April, including braces against Swindon at the County Ground and against Scunthorpe at stadium:mk. He faces stern competition from Preston’s Jermaine Beckford, Swindon midfielder Ben Gladwin and Walsall defender James O’Connor. Karl Robinson, who won the Manager of the Month award back in January, has been nominated once again after leading his side undefeated through April, picking up 19 points from a possible 21, scoring 20 goals in those seven games. Robinson goes into the running alongside Steve Cotterill, who led his Bristol City side to the League 1 title, and Chesterfield boss Paul Cook who secured their spot in the play-offs.